"The Unknown Righteous Among the Nations"
Although this was my second time to Israel's National Holocaust Memorial & Museum it had the same, if not more powerful effect on me. Once again, Elliott Chodoff provided incredible depth and insight to the tour. Moving through room after room of stories and artifacts that brought alive the tragedy that gripped the world not so long ago. I still can't help but feel the panic and helplessness for a population who were hunted down and exterminated by a major industrial world power of the time. The world stood by and watched as the Jews were systematically collected and killed. The Germans simply did not get rid of all of the Jews in Germany, they were set to find and eliminate all of the Jews throughout the entire world! The individual stories that were depicted were difficult to hear. The movie footage and pictures were attempting to give a sense of how the anti-Semitic wave came to a crest and crashed upon the world during the Nazi's regime. Even with all of the artifacts, testimonials, pictures, movies, modern videos, government documentation, records, and the like it is still difficult to believe the extent of what occurred. Further more, it was perpetuated by educated "modern" thinkers, many of whom had doctorate degrees in humanities. Going here takes me to a dark place that is reminiscent of sublime, impossible nightmares of what hell must be like. A world gone mad. It made me think: We can't let things like this happen. We mustn't be the victims of these atrocities, nor must we allow ourselves to let fear and hate turn US into being the killing monsters of genocide. It is all too easy to fall down the slippery slope of dehumanization. This is why activating the idea of Universal Life Values is so important. When Ever I Go Home People Are Glad That I Am There. 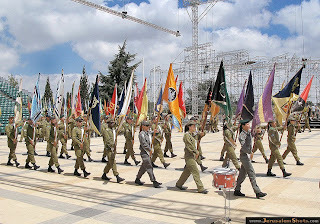 Mount Herzl has served as Israel's national cemetery since 1951, following a government decision to establish a cemetery for Israeli leaders and fallen soldiers. Mt. Herzl is the burial place of three of Israel's prime ministers: Levi Eshkol, Golda Meir and Yitzhak Rabin (who is buried beside his wife Leah). Israeli presidents are also buried on Mt. Herzl, as are other prominent Jewish and Zionist leaders. Mt. 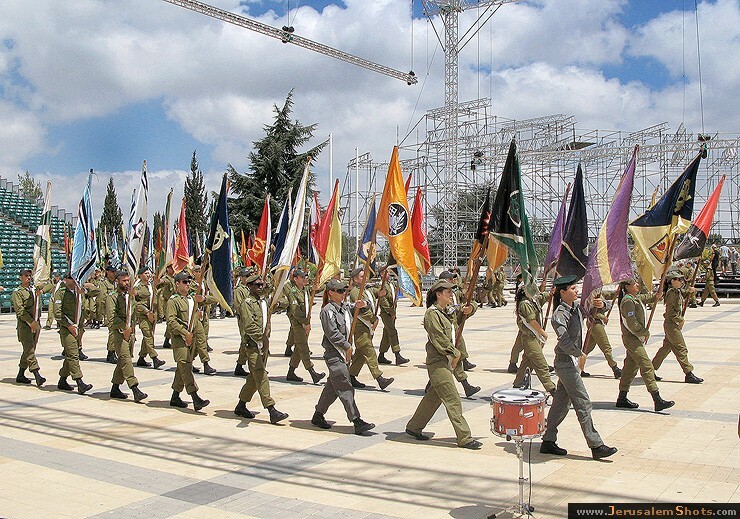 Herzl is the venue for many commemorative events and national celebrations. Although the cemetery is filled with countless hero's of Israel's past I want to talk about one very alive young man named Don (Name changed to protect his identity). I had the pleasure to meet and talk to Don, a young man Born in the United States who decided to become a Israeli citizen and join the Israeli army. He is currently completing his training in one of the toughest special forces /counter terrorist divisions in the world: Israeli Army's Duvdevan. He took time from his tough training schedule to talk to us about his life, why he decided to join the Israeli Army and what his life was like here. He filled us in on the history and realities of military life. He told us what it was like to live here from the States and live in the army. He loves what he is doing and although it is difficult he wouldn't have it any other way. Keep going Don. I admire your courage. The sun was hot, but not unbearable. Once in the shadow of the rock face it was actually pretty nice. The climb was a nice workout that felt good after being in the tour van for so long this week. Elliott stopped our accent a few times to fill us in on how the Romans would lay siege on to the Jewish Rebels of Masada. He showed us the ruins of the 7 foot siege wall, the outpost and command center that the Roman soldiers built around the entire rock plateau. Elliott explained how it only took the soldiers about one week to do this. It was amazing that their was still remnants of the structures left after two thousand years of erosion. Elliott went on to explain that the command building was positioned in such a way that the commander could actually talk to the people on top of Masada. I'm sure what was said between them was less than friendly. We continued to climb the steep stairs until we finally reached the summit. Looking down we could see the remains of the ramp that the Roman soldiers built that went from the ground below all the way up to the top of the plateau. The Romans used Jewish slaves to build the ramp to stop the rebels from attempting to harm the workers as they built the ramp. You can read about the rest of the story by clicking here. Vanda escapes her husband James hold on her Krav style! As an intermission between Elliott's commentary, Mike Benson and I rounded the crew up for some Krav Maga training. I had the honor of introducing six Americans to authentic Israeli Krav Maga on the top of legendary Masada! Not a bad day at all! How many people can say that their first Krav Maga lesson was on Masada in Israel!? One of the main things that I wanted to get across regarding Krav Maga went beyond technique. It was about the attitude, so what better place to get that point across than on top of Masada!? That's the true essence of Krav Maga! Those people who stood up against the Roman's chose between really bad and and a whole lot worse. They believed it was better to chose to die in a manner that they controlled, a more dignified way than succumb to the fate that they would have at the hands of the Roman Army. A tough decision would be an understatement. During a recent trip to Israel I had the unique opportunity to be part of an intimate conference with renowned journalist Khaled Abu Toameh. Khaled is an Israeli Arab journalist, lecturer and documentary filmmaker. He is the West Bank and Gaza correspondent for the Jerusalem Post and U.S. News and World Report, and has been the Palestinian affairs producer for NBC News since 1988. His articles have appeared in the Wall Street Journal, World Tribune, and many other newspapers. Khaled spoke to us about his experience and opinions on the Palestinian / Israeli situation. Fascinating doesn't even begin to describe what the next couple of hours were. The room was electric with both excitement and curiosity as each of us sat in our chairs, giving Khaled our undivided attention. He began by saying that there are currently 1.5 million Arabs living in Israel making up about 20% of Israels total population. These people are called Arab Israelis. He went on to say that he used to work for a PLO (Palestine Liberation Organization) paper as a journalist before he began to write as an Israeli and intentional correspondent. He said that the Palestine/Arab factions do not allow freedom of press and any reporter that is critical toward the government would be censored and in danger of imprisonment, violence or even death. Being a reporter in this part of the world can be very dangerous. The violence continued to ramp up and in September of 2000 it became very dangerous going to the West Bank and Gaza as a reporter. In 2006's Yasser Arafat went against the Hamas in an open election. The Hamas was a strong party that made promises and semed better than the PLO in the eyes of the people. They promised the desperate Palestinians change and reform. This sentiment combined with the Palestinian people being mad at the PLO, believing that they were cheating them made the Hamas seem like a better deal, winning them the 2006 Palestinian legislative election. Currently 1.5 million in Gaza are run by Hamas. This discussion made me wonder, so what happens when a free democratic election elects a terrorist organization or dictator to take power? It's happened before. We think of free democratic elections as being good, however is that always the case? Khaled feels that if the Israeli Defense Force (IDF) were to leave the West Bank that the Fatah (PLO) would be removed by Hamas. Fatah is the largest faction of the PLO. For those of you who are wondering, Hamas runs the Gaza strip and Fatah runs the West Bank. He continued to say that there were two basic types of Islamic groups in Palestine: Radical: Those who want all the Israeli land back and Israel to be destroyed. Moderate: Those who want to see Israel give back all the land that they acquired 1967's 6 day war. Both of these groups want an "all or nothing" deal and Khaled firmly believed that they would not compromise in the slightest. Khaled explained that both groups know that this would be impossible which fuels their continued resistance, however, any concessions would not be considered.